Can you imagine the scalability and efficiencies afforded by technology ever replacing the value of human interface in the industry? Some people can . Recently I discovered some interesting statistics for content buyers and sellers, in research by Rights Trade, a global online marketplace for content. Around 73% of film and television rights remain un-sold in the first five years, while at the same time, the explosion of media channels has sent 5,000+ new TV and VOD buyers into the market in the last five years. These figures demonstrate that most new formats don’t get sold, while there is a growing demand for content generated by the ever-expanding choice of channels. This seems an anomaly when the public complains of format fatigue. Each month creators, producers, buyers and sellers of content for film and television congregate at various film and television markets that occur somewhere in the world to buy, sell, learn and network. These markets can be a valuable opportunity to build industry relationships and fun to attend for first timers excited to be in the midst of the industry, but in reality, they seem to mask an inefficient sales process that’s at once chaotic, expensive and labour intensive. 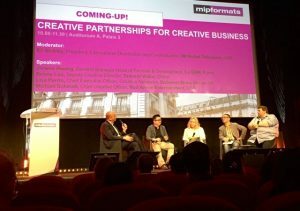 Earlier this year at MIPTV in Cannes, I met with Mark Lawrence, Executive Director EMEA of Endemol Shine International and we discussed the average cost of one half hour meeting for them at MIPTV in Cannes. He estimates with all things considered and when all associated expenses for their presence there were calculated, the cost could be as high as 500 pnds p/r half hour meeting. If someone has not researched and qualified the meeting well, turns up late or worse is a no-show, that’s a pretty expensive 30 minutes of tardiness. Not to mention the time lag a content license or acquisition transaction can take to come to fruition, which can be up to and exceed six months. That’s a big commercial incentive to find a more economical alternative. Major studios and companies like FilmTrack (the leading rights management software provider platform that tracks avails), have built platforms to manage and track their avails, which on any particular title available worldwide, could have up to 2,000 rights available. FilmTrack is now a major shareholder in RightsTrade, a global platform that allows sellers of content to list their avails and buyers to shop and bid on the content. It can condense the transaction process to around six days and is also highly transparent. The standardising of the content sales process through an electronic interface certainly represents a great leap in efficiencies, but I’m not convinced that this initiative will totally replace the value found in face to face at conferences, any more than computers did away with paper, online video conferencing replaced face to face meetings or online travel bookings replaced the travel agent. It’s a great tool to be sure, but I think there’s still a value in human interaction.